The NYC Dept. of Housing Preservation and Development unveiled the development team for phase II of the Livonia Ave. Initiative. The team consists of BRP Cos., HELP USA, the Local Development Corp. of East New York (LDC ENY) and the Community Solutions organization, with Magnusson Architecture and Planning, PC (MAP) as architect of the project. "BRP and its development team members are excited to work with the City of New York and MAP. We believe the project is a key component to the city's vision for the revitalization of the Livonia Corridor," said Mary Serafy, director of Ddesign at BRP Development Corp.
L2, the official title of the new development, will be constructed on four separate city-owned sites (Site 6-9) located in the East New York neighborhood, bounded by Van Sinderen and William Aves. The proposed new development will provide 288 affordable units. All of the four sites are currently vacant. Along the side streets that intersect Livonia Ave. are a variety of townhouses and older multi-family buildings, as well as some active industrial and storage facilities. The elevated train lines along Livonia and Van Sinderen Aves. constitute major visual elements of the neighborhood and provide convenient transit access for residents; however the noise and the shadowing of the streets and adjacent buildings present clear design challenges as well. The project design is intended to extend the newly revitalizing Livonia Corridor, with specific consideration given to enhancing both the mixed-use streetscape at ground level and the upper residential floors facing the elevated subway. 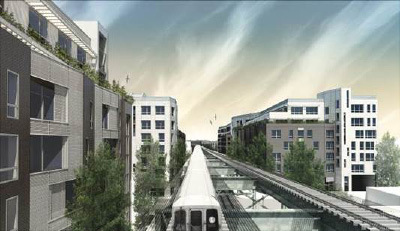 The new buildings will feature tall and open storefronts at the sidewalk level, with facades above that are gently angled to turn apartment windows slightly askew from the train line This will create more privacy options for apartment residents and a varied vista above the track level. The proposed buildings include units for both individuals and families, providing urgently needed housing in state-of-the-art architecture. Light-filled apartments will be equipped with modern bathrooms and open kitchen layouts, and windows and ventilation will be designed to mitigate noise transmission from outside. Amenities will include parking, a common laundry room and community room for each building, with adjacent outdoor terraces to allow for gathering and interaction. Planted set-back roofs will be visible from common circulation areas. Play areas are located close to laundry rooms so that laundry can become a family experience rather than a chore. The buildings will incorporate many features to enhance sustainability, promote residents' health and encourage physical activity. Each building will be designed to provide maximum natural light in elevator lobbies and public corridors, and egress stairs will be located either adjacent to entries and elevator cores in order to encourage daily use, or will have windows facing the street to enhance security and connection to the surrounding neighborhood. Common outdoor terraces for residents will include simple fitness equipment for adults and play areas for children. Building envelopes and mechanical systems will be designed to meet Energy Star and NYSERDA MPP standards with cost effective equipment including high efficiency boilers and heat recovery units at roofs. Passive solar devices such as exterior sunshades on south facing facades will reduce glare and heat buildup within apartments and in common areas. Appropriately oriented photovoltaic arrays are also proposed at all top roof levels to reduce the cost of common electric loads and enhance future affordability. Magnusson Architecture and Planning (MAP) is an award-winning, full-service architecture and planning firm in New York City committed to sustainable development that builds vibrant, healthy communities. The firm's specializations include housing, educational and community facilities, healthcare facilities, commercial developments, and community planning. MAP's clients include community groups, agencies, municipalities, institutions, real estate developers, schools and non-profits in the New York City region, such as The Community Builders, Inc., Westhab, Inc., The Doe Fund, Volunteers of America, CPC Resources, Inc., L+M Development Partners, Columbia University, Lutheran Social Services of Greater New York, Procida, Enterprise Foundation, St. Nicks Alliance, Douglaston Development, The Housing Collaborative, the South Bronx Overall Economic Development Corporation, and the Fifth Avenue Committee.